Home » latest-on-page-activities , on-page-activity , seo » What are The Latest SEO On Page Activities? What are The Latest SEO On Page Activities? You will find here the complete information about on page activities of search engine optimization. The huge status of latest criteria of using on page activities is not just performing your task but also provide a unique identity to your business website over all search engines. To grow your business requirements worldwide you would like to analysis your website. And it’s necessary. Whenever checking the website, you want to find the issues and get ready to resolve as soon as possible. 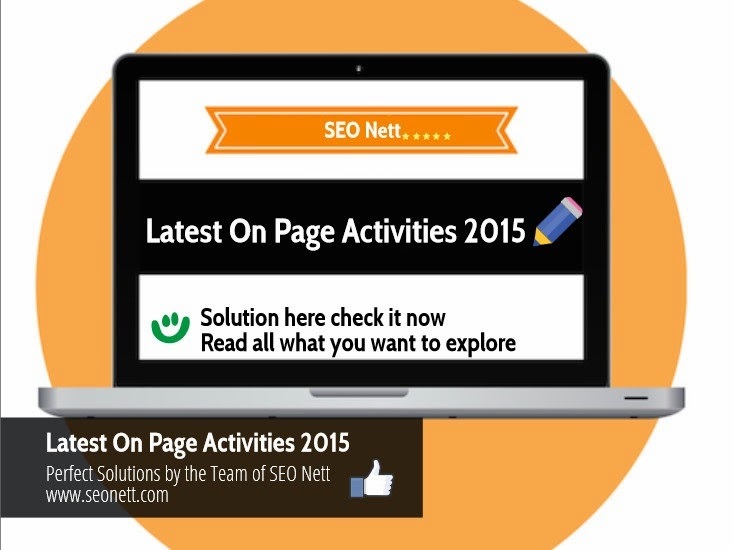 Latest SEO On Page Techniques in 2015! To make your website SEO based it is compulsory to do on page optimization of the business website and follow the guidelines as per Google guidelines. What the things initially you need to check out, let’s attention on them. Website’s indexed or cached status. The last and main step is now to build your website more compatible to work with webmaster. I mean to say use rich snippet code as data highlighter and structured data tools to make websites presence more effective and user interactive in search engine. You also can customize your website’s structure as per Google or Bing webmaster’s guidelines.